SAMUEL H. LIBBEY is a farmer living near Reno, in Bond County, this State, and as a veteran who served gallantly in the late war, commands the regard of all people of patriotic instincts. Mr. Libbey is a native of this county, having been born near the place where he now lives October 22, 1840. He was the sixth child in the family of nine children born to William P. and Sallie (Drown) Libbey. William P. Libbey was a native of the Pine Tree State, and he went across the border into New Hampshire in order to get a wife. In 1836, they came to Illinois and settled on the farm where our subject was born. Later, they went to Elm Point, and there Mr. Libbey, Sr., died in 1862, while his wife did not long survive him, as she passed away in the same year. All of their children, with the exception of two, still survive and are named as follows: Amanda F., William Albert, Sarah A., I. H., John B., Edward P., and our subject. The eldest sister is the widow of Leonard Jernigan, and now lives at Newton, Kan.; William resides at Coffeen, Montgomery County; Sarah A., the widow of A. A. McLean, lives at Newton, Kan.; I. H. is a farmer living near Newton, Kan.; John, who served in the First Cavalry during the late war, is a real-estate agent at Altamont, Kan.; and Edward P., a farmer living near Newton. June 11, 1861, Mr. Libbey went into the army and served in Company D, of the Twenty-second Illinois Infantry. He enlisted as a private and gave three years of good service and was discharged July 7, 1864. He participated in many of the hard-fought battles of the war, among them those of Belmont, Island No. 10, Pittsburg Landing, Farmington, Corinth, Nashville, Stone River, Chickamauga and Missionary Ridge. After coming out of the army, the original of our sketch resumed his farming, but later became engaged in the mercantile business, which he followed until 1880, when he bought his present farm which adjoins the town of Reno. Our subject was married on the 17th of March, 1862, taking the step after he had entered the Government service. His bride was Miss Nancy Elizabeth McCracken, like himself a native of Bond County, and born near the present site of Sorento. Mr. and Mrs. Libbey have been the parents of four children, whose names were Minnie M., James William, Ella and John Albert. The eldest daughter died after a brief period of married happiness with Dr. R. Seymour; J. W. married Ida Jett and lives on a farm near Reno; Ella married G. M. Redfearn, but is now deceased; John Albert, who has just reached his majority, is still a young bachelor at home. Ella left one daughter, Minnie Ella, whom the grandparents have adopted as their own. Mr. Libbey springs from a long line of Whig ancestors who became Republicans upon the organization of that party, and there has never yet been a member of his family disloyal to his party and principles. He lives anew in the experiences of his military career in his reunion with his soldier comrades, being a devoted Grand Army man. His wife is a member of the Presbyterian Church of Reno. 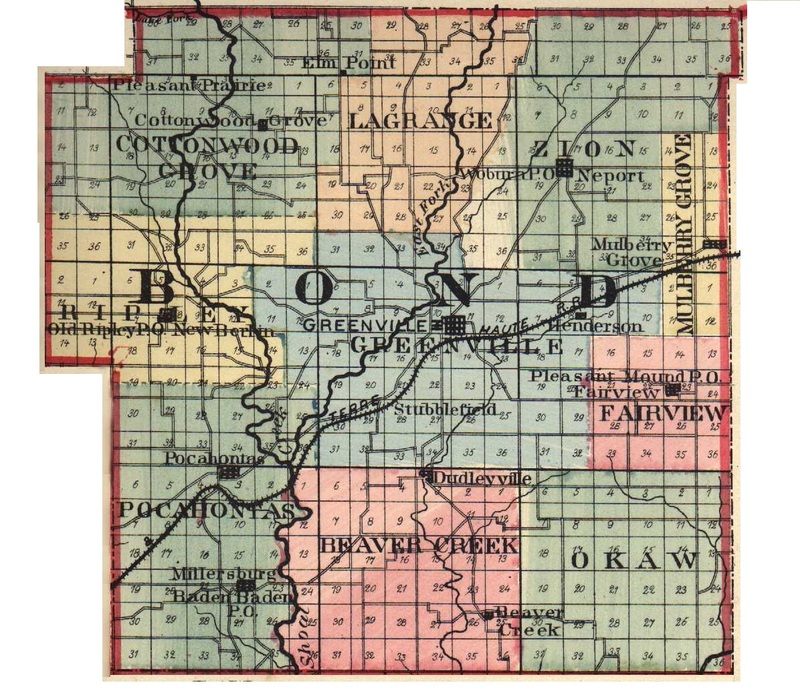 Extracted 29 Nov 2016 by Norma Hass from 1892 Portrait and Biographical Record of Montgomery and Bond Counties, Illinois, pages 127-128.